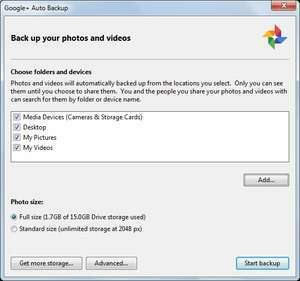 Back up your cameras, phones, & storage cards with Google Auto Backup: If you choose to sync your phone, camera, or storage cards in the set up, then every time you connect them to your PC the photos and videos on them will automatically sync (after prompting you the first time). You can change these settings any time in your Auto Backup Preferences. Photo - JPG, WEBP, GIF, CRW, CR2, NEF, DNG, ORF, RAF, ARW, PEF, SRW, RW2. Video - MPG, MOD, MMV, TOD, Windows Media Video (*. Version 3.9.137.0 is a freeware program which does not have restrictions and it's free so it doesn't cost anything. For security reasons, you should also check out the Google+ Auto Backup Desktop download at LO4D.com which includes virus and malware tests. Additional screenshots of this application download may be available, too.